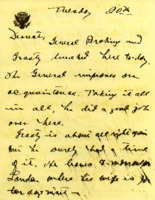 Cary Grayson thinks that despite his contribution to the luncheon, Edwin Watson’s remarks regarding Grayson’s ability to converse in Spanish caused confusion. 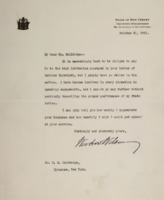 This note, possibly from Cary Grayson to Edwin Watson, criticizes FDR’s Military Aide as not alert. 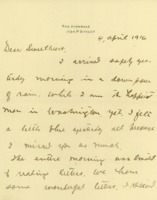 ME Hennessy writes a brief account of Woodrow Wilson’s widow, Edith Bolling Wilson who was one of six living presidential widows. 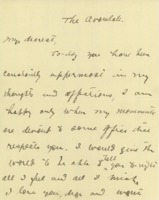 Woodrow Wilson tells Mr. Weisiger that due to caller and arrangements made for him, he will be unable to meet as he had wished. 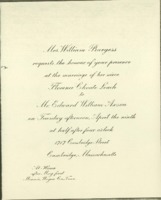 This invitation invites the receiver to meet Woodrow Wilson. 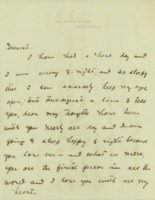 Alice Garrett writes about Jessie’s plans to visit her after the wedding, mentioning the need for secrecy so that Jessie can avoid notice by the press and curiosity seekers. 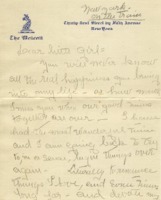 Margaret Axson Wilson tells her sister of her travel schedule to Chapel Hill and various items of social news. 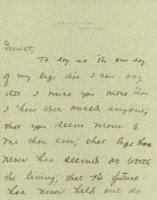 Woodrow Wilson advises Jessie Wilson Sayre not to go to a convention as a delegate for her fraternity as he does not want her to neglect her studies. 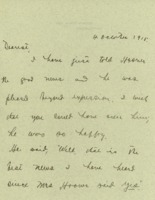 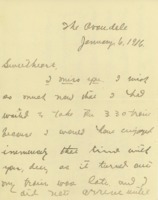 Margaret Axson Wilson writes of social life in Princeton in January and wishes Jessie Wilson Sayre good health. 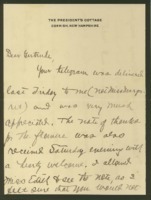 Margaret Wilson tells Jessie Wilson Sayre about her busy week. 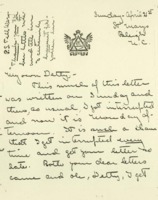 Eleanor Wilson McAdoo writes Jessie Wilson Sayre with news from St. Mary's School, in Raleigh, NC, and tells Jessie her schedule. 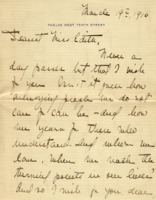 Ellen Axson Wilson writes to Jessie Wilson Sayre about her new curtains and other social engagements. 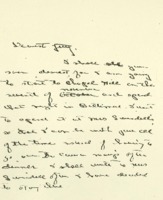 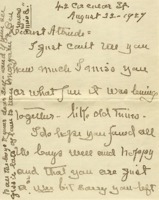 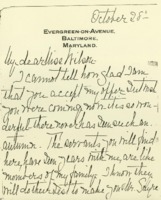 Margaret Wilson writes to Jessie Wilson Sayre telling her about attempts to visit a dentist in Philadelphia. 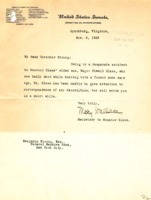 Woodrow Wilson writes Justice Mahlon Pitney and his wife to thank them for a Kirk pitcher, a wedding present. 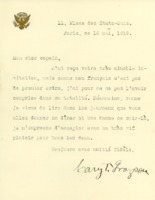 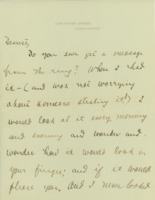 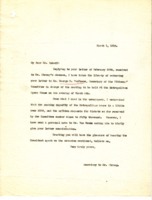 Woodrow Wilson writes R.H. Selfridge to decline an invitation. 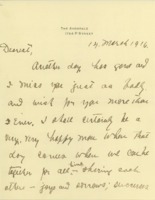 Clarence F. Pritchard sends Benjamin Strong III some items relating to his father. 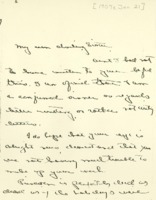 Benjamin Strong Jr. wishes Carter Glass's son-in-law a quick recovery. 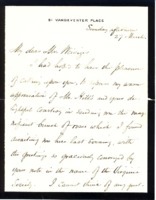 Benjamin Strong Jr. accepts Carter Glass's invitation for a meeting. 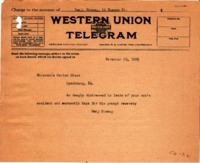 Carter Glass to Benjamin Strong Jr.
Carter Glass telegrams Benjamin Strong Jr. to arrange a meeting. 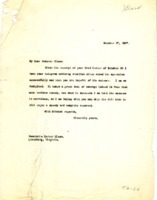 Benjamin Strong Jr. sends best wishes to Carter Glass after his son's hunting accident. 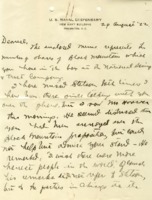 Mary Wallace to Benjamin Strong Jr.
Mary Wallace informs Benjamin Strong Jr. that Carter Glass' son has been in a hunting accident. 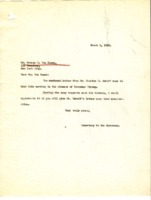 Carter Glass writes to Benjamin Strong Jr. to thank him for welcoming him to New York. 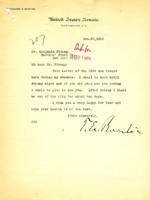 Benjamin Strong Jr. thanks George R. Namee for sending him tickets to a meeting at the Metropolitian Opera House. 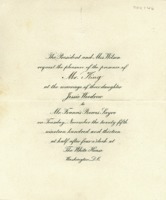 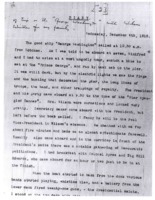 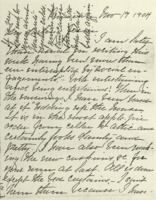 George R. Van Namee to Benjamin Strong Jr.
George R. Van Namee sends Benjamin Strong Jr. a ticket to a presidential speech at the Metropolitan Opera. 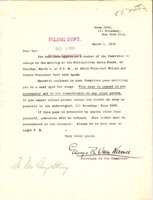 Benjamin Strong Jr.,'s Secretary forwards a request for tickets to a presidential speaking event at the Metropolitan Opera. 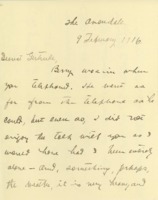 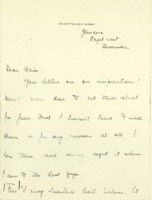 Benjamin Strong's secretary writes Charles H. Imhoff to tell him that he has forwarded Imhoff's request for tickets to George R. Van Namee. 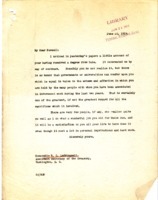 Benjamin Strong Jr. writes the Committee on Admissions of The Century Association, to recommend the admission of Russell C. Leffingwell. 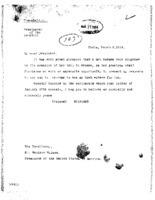 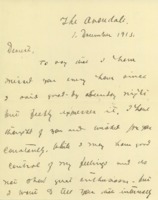 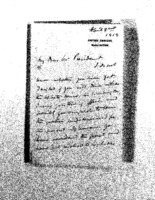 Benjamin Strong Jr. writes Woodrow Wilson to apologize for being insistent in his invitation. 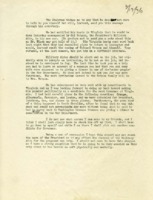 M.B. 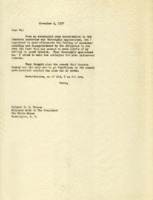 Clagett to Benjamin Strong Jr.
M.B. 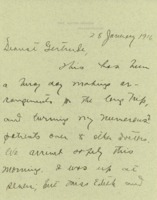 Clagett writes Benjamin Strong Jr. to reschedule Strong's meeting with William G. McAdoo. 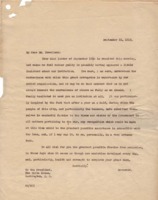 MB Clagett to Benjamin Strong Jr.
Benjamin Strong Jr. writes M.B. 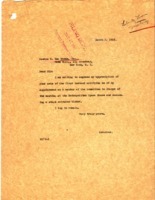 Clagett to confirm an appointment with William G. McAdoo. 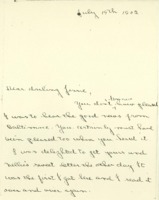 William G. McAdoo send Benjamin Strong Jr. a thank you note for some apples. 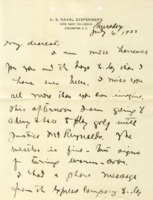 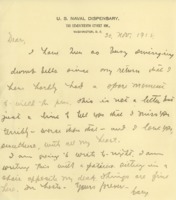 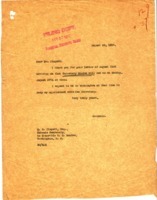 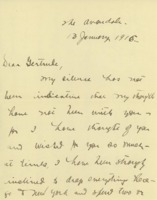 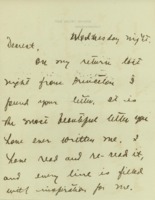 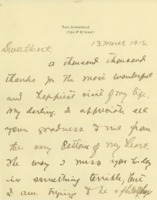 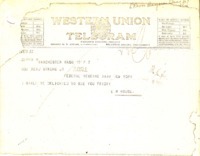 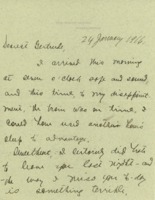 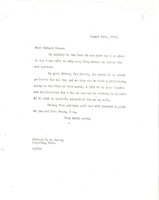 Senator Theodore E. Burton writes Benjamin Strong Jr. to say he will be available for a visit Friday night.